“We are always telling a story to ourselves, about ourselves,” Dustin Tillman likes to say. It’s one of the little mantras he shares with his patients, and it’s meant to be reassuring. But what if that story is a lie? A psychologist in suburban Cleveland, Dustin is drifting through his forties when he hears the news: His adopted brother, Rusty, is being released from prison. Thirty years ago, Rusty received a life sentence for the massacre of Dustin’s parents, aunt, and uncle. The trial came to symbolize the 1980s hysteria over Satanic cults; despite the lack of physical evidence, the jury believed the outlandish accusations Dustin and his cousin made against Rusty. Now, after DNA analysis has overturned the conviction, Dustin braces for a reckoning. Meanwhile, one of Dustin’s patients gets him deeply engaged in a string of drowning deaths involving drunk college boys. At first Dustin dismisses talk of a serial killer as paranoid thinking, but as he gets wrapped up in their amateur investigation, Dustin starts to believe that there’s more to the deaths than coincidence. Soon he becomes obsessed, crossing all professional boundaries—and putting his own family in harm’s way. The summary of Ill Will sounded incredibly interesting when I was browsing on NetGalley. Two unsolved crimes across a span of many years connected by one man. It sounds intriguing, right? Well, the first part of the story did hold my attention, but as I read on, the novel became more and more drawn out. The narrators changed many times and went back and forth from past to present so often that my head was spinning, but I trudged on hoping for an exciting ending. As I continued reading, I found the characters to be completely self centered and totally incapable of seeing anything but what is right in front of them. I think Chaon purposefully wrote the characters to be this way, and I'm not sure I was really supposed to connect with them or like them very much. I hope not, because they were all extremely strange. There were many things I didn't enjoy about the book, but I still found myself unable to put it down. It definitely had a dark feel to it and I think that is why I felt so strangely about it. I liked it and at the same time I didn't. I wanted to put it down, but at the same time I really needed to know what happened at the end. I didn't like the characters, but I didn't want bad things to happen to them. See why I'm confused? 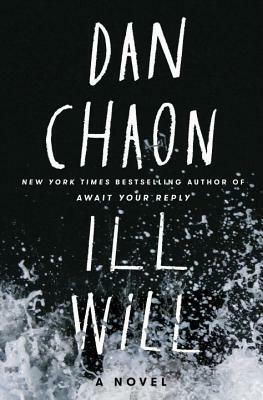 All in all, Ill Will is a chilling thriller that truly makes you question your own perception of past events. It caught my attention from the first page, and even though it was dark and twisted, I found myself enjoying it. I would recommend this book to readers who enjoy suspense and crime novels.